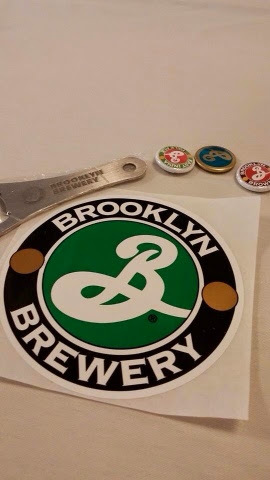 TShawn and I were fortunate to be invited by Big Hungry Melinda and BLD to join them at the Binghamton Club’s Brooklyn Brewery beer pairing dinner last week. The City Club has a new chef, who decamped from Remliks somewhat recently, and seems to be doing good things. I would not have wanted to necessarily blog about dinner at the Bing Club in the past, but this meal was definitely a step up, and as Shawn has been known to enjoy a beer or two now and then, this event was right up our alley. As ever, the facilities at the Bing Club are lovely. You kind of can’t beat the ambiance created by the epic, three story double staircase, and the dining room we were in for the dinner was small enough to be intimate, but big enough for comfort. We weren’t jammed in there, but neither were we in the big ballroom, shouting to each other about beer. I do wish they’d take a couple months of one family’s dues and update their restrooms a bit. The one on the third floor is a bit elementary school-chic for me, but I’m mincing hairs here. 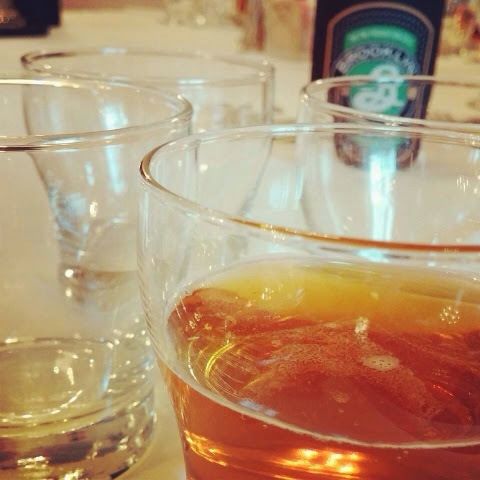 We began our evening with a full can of Brooklyn Lager, the brewery’s flagship beer. You might think canned beer an odd choice for an ostensibly upscale dinner, but our brewery rep Lindsey explained that, because the can prevents light from reaching the beer, it actually keeps fresher longer and you get a better product. Who knew I was such a gourmet all those years ago, buying sixers of Busch Light at the mini-mart next to campus in Laurinburg, NC? Thank GOODNESS I knew enough to preserve all the taste and flavor of that magical elixir! Brooklyn Lager is a prohibition-style beer, meaning its brewed with real hops and malt, not cheater ingredients like corn or I don’t know, pig trotters. It was a bit more robust than my usual Labatts Blue Light, but I liked that there was no bitterness but quite a bit of depth to the drink. 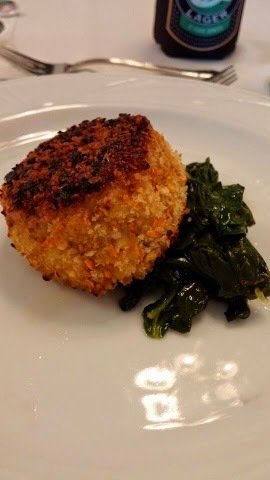 The first course was a small sweet potato encrusted crab cake set atop lemony sautéed spinach. Again, having eaten at the Binghamton Club for years, I wasn’t expecting much from this, so I was pretty blown away by how good it was. I expected the sweet potato to add too much sweetness, and the wilted greens to lack in flavor, and I was mistaken. The crab was high quality and fresh, not put together with too much binder, the potato crust was done very subtly but nicely crunchy on the outside, and the lemon in the spinach really added to the overall flavor profile of the dish. The beer served with this was Brooklyn Pennant English-style Pale Ale, and it was my favorite of the night. It was crisp, light, and played off the seafood very well. I would buy this beer out at a restaurant, which is an out of the ordinary statement for me, but I liked it that much. 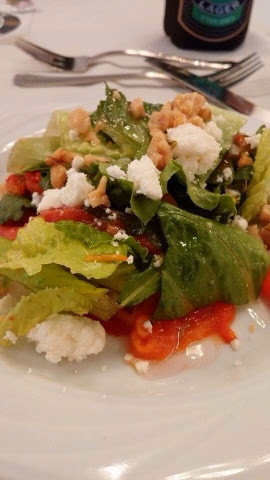 The salad course was next, and again, I anticipated a boring, humdrum bowl of romaine, but was instead given an incredibly well balanced small plate of romaine and arugula, with a light lemon vinaigrette, sweet roasted red peppers, earthy walnuts, and really gorgeous, full fat creamy feta. I often eat reduced fat feta at home, so I’m always taken off guard about how good it is when it’s the real thing. Yum. The salad beer, if you will, was Brooklyn Summer Ale. This was very light and nearly citrusy – sort of the Fresca of beers. I didn’t find it as smooth as the Pennant Ale, and a bit less drinkable, for me, but it was good with the salad. The fish course was, surprisingly, my favorite of the meal. And I cannot stress to you enough the degree to which I expected to dislike the dish, which was salmon. I love seafood, but have never much liked salmon – the oily, heavy uncle of such delights as halibut, scallops, and tuna. It actually kind of bums me out that salmon is almost always the fish choice on standard menus, and I was not looking forward to this course when I initially read the menu. So Mr. New Chef, well done! This small, blackened medallion of salmon was cooked perfectly, nice and pink in the center. The scallion cream sauce served under it was rich and a pretty glorious foil to the dark, caramelized blackening spices on the fish. Lindsey served it with Brooklyn India Pale Ale, which is just not my bag. I can’t take all the hops, man! I passed this glass over to Shawn and let him drink his fill. 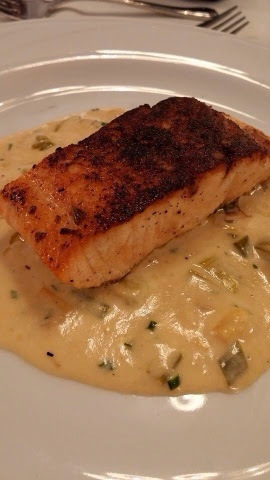 I had plenty to occupy me in that creamy, dreamy sauce and spiced salmon. Pour me some of number 4! 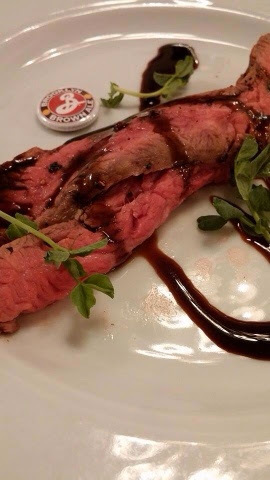 Next up, peppercorn-crusted London broil slices with tamarind glaze. This one fell short, for me. I think a couple slices of ribeye or a short rib cooked in beer would have worked better. I know what they were going for with the tamarind, which is a sour pod used in Indian cooking, but honestly, I could barely taste it. The meat was a bit on the tough side, and there just wasn’t enough going on on the plate for me, to stand up to the Brooklyn Brown Ale served with this plate. The beer is caramelized, deep, and slightly bitter (though not as bitter at the IPA), and for me, a fattier cut of beef or smoked barbeque would have balanced those malty flavors. We finished up with another really good beer, Brooklyn Black Chocolate Stout, and a dessert I was excited for, but didn’t quite live up to its promise: chocolate crème brulee. 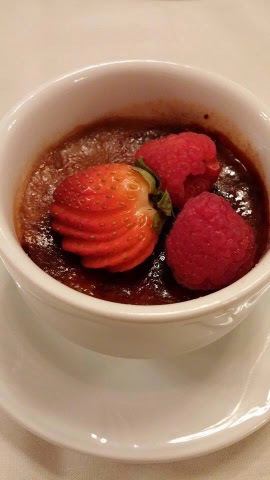 The coffee-tinged, dark, deep, beer was smooth as silk and incredibly yummy with the chocolate flavor of the crème brulee, but the custard was all wrong in texture. The small cup I received was gritty, as if the sugar hadn’t been properly incorporated into the egg yolks when the base was prepared. I liked the berries on top, and the chocolate flavor was fairly good, but the mouthfeel was so discordant, I drank my beer by its lonesome. Special events like these are so fun. PS Restaurant, in Vestal, one of my longtime favorites, does a wine dinner every few months, and I'm desperate to go, and ditto to the beer dinners at the Hops Spot in Sackets. Now that we've participated in one, I'm hoping our little group will want to do more. As a side note, if you're looking for a way to fire up your social life, do look into membership at the Binghamton Club. If we lived closer to Binghamton, we would definitely be members. Not only does membership afford you events like this one and the great Parade Day buffet, but free, nearly private bowling becomes available to you, there's a very nice gym and saunas for members only, reciprocal membership with Vestal Hills Country Club, which means pool use (! ), plus bowling leagues and the ability to snootily tell people you're going to the club tonight. Just like Mad Men! I'm jet setting again - this time a unique combo deal of two nights in Staten Island, followed by four in Hamburg, Germany. I'm very excited to bring you all the review on SI's Enoteca Maria, where Italian nonnas cook you dinner, but almost more excited for whatever Hamburg has in store for my gustatory system. I'm betting it won't be hamburgers! So I'll see you back here two Wednesdays from now...My personality is big; my hunger is bigger! The salmon and London broil look fabulous. I prefer canned beer to bottled.